Charter the Micat – Your next event could be a little different! What better place to hold your private event than on our luxury catamaran cruising along the Brisbane River or across the bay onboard the Micat to beautiful Moreton Island. 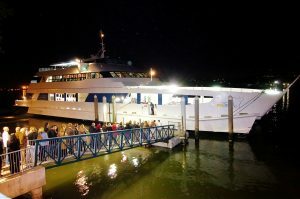 Moreton Island Adventures creates extraordinary corporate events on our large vessel the Micat. With three very unique deck levels, Micat is ideal for large corporate entertaining, product launches and private functions. With a capacity of 600 guests utilising all three levels of the ship, the Micat vessel offers something unique as it cruises along the Brisbane River. Specialising in innovative fresh cuisine in all styles, Micat can transform into your ideal event venue. The Micat is the only vessel with a vehicle deck which is able to travel along the Brisbane River. Our ability to carry large numbers of people and very large merchandise makes Moreton Island Adventures Micat the perfect choice for your next corporate event! Complete the details below and our team will respond to your request as soon as possible!